Fermanagh, the most westerly county of Northern Ireland, presents a blend of scenery, history and culture that makes it one of the most attractive of all Irish counties. With its many lakes, rivers and wooded islands, water is a predominant feature, covering 30% of the county, and this is reflected in the prevalence of fishing and the dominance of dairy over arable farming. The climate, too, leans to moistness, and the county’s green, lush quality is directly related to its comparatively high rainfall. There is a saying that for half the year Lough Erne is in Fermanagh, and for the other half Fermanagh is in Lough Erne – a not altogether inaccurate description of the complex interaction of water and land in the county. 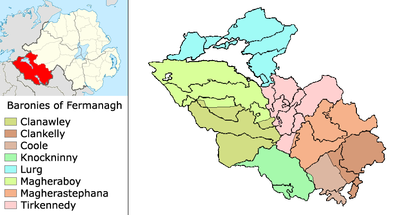 Covering some 1,850 km2, Fermanagh has land boundaries with counties Tyrone, Donegal, Cavan, Monaghan and Leitrim. The 2011 population was approximately 68,000. Upper and Lower Lough Erne, threaded by the River Erne, dominate the centre of Fermanagh, extending more than 40 miles from north-west to south-east. The lower lake is the larger, measuring seven and a half miles across, with the upper lake being four and a half. Draining into the Erne basin are the Arney, Sillees, Tempo, Kesh, Ballinamallard and Swanlinbar rivers. Apart from the Erne lakes, there are Loughs Melvin, Navar and Upper and Lower Macnean, all offering boating, fishing and water-sports and contributing to Fermanagh’s strong tourism economy. 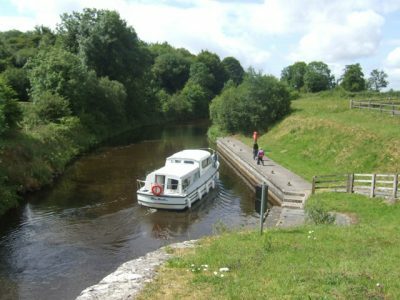 The Erne-Shannon Waterway, re-opened in the mid 1990s, links Enniskillen with Limerick and offers a peaceful route across central Ireland via lake, river and canal. Fermanagh’s hills and mountains are mainly around its rim, many presenting dramatic limestone and sandstone scarps much favoured by climbers, cavers and walkers. The most striking points are in the region of Cuilcagh Mountain (665m), straddling the Fermanagh-Cavan borders, and the adjacent Marlbank and Hanging Rock. 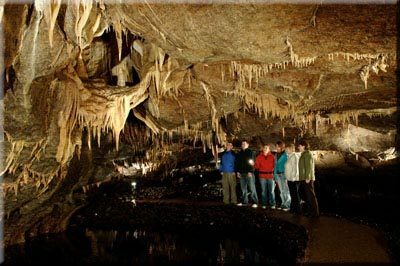 There are extensive caves around Boho and Marble Arch, while the limestone knolls, jagged valleys and cliff faces of the Knockmore district, around Derrygonnelly, have earned it comparison with Switzerland. 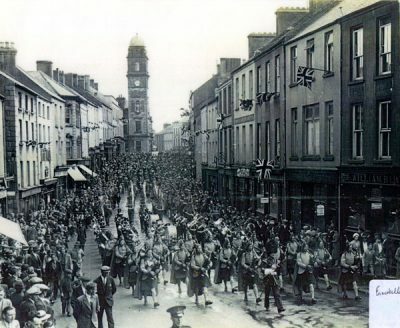 The only town of any size is Enniskillen, built on an island on the River Erne between the upper and lower lakes and with a long military and trading history. Other settlements include the small towns and villages of Irvinestown, Lisnaskea, Garrison, Belleek, Derrygonnelly, Belcoo, Ballinamallard, Newtownbutler, Tempo, Brookeborough and Maguiresbridge.